You need to make reports that are easily printable. People often want “hard copies” of particular reports they are running and don’t want to reproduce everything they did in an interactive dashboard. You need to match existing reporting formats: If you’re replacing a legacy reporting system, it’s often a good idea to try to match existing reporting methods as your first step. This means that if the legacy system used PDF reporting, then you should strongly consider creating this functionality in the replacement system. This is often important for getting buy-in from people comfortable with the old system. Jinja2 templates to generate HTML files of the reports that I need. Pdfkit to convert these reports to PDF. Note that you also need to install a tool called wkhtmltopdf for pdfkit to work. Jinja2 is a great tool to become familiar with, especially if you do web development in Python. In short, it lets you automatically generate text documents by programmatically filling in placeholder values that you assign to text file templates. It’s a very flexible tool, used widely in Python web applications to generate HTML for users. You can think of it like super high-powered string substitution. We’ll be using Jinja2 to generate HTML files of our reports that we will convert into PDFs with other tools. Keep in mind that Jinja2 can come in handy for other reporting applications, like sending automated emails or creating reports in other text file formats. Creating the text file Jinja2 templates that contain placeholder values. In these templates, you can use a variety of Jinja2 syntax features that allow you to adjust the look of the file and how it loads the placeholder data. Writing the python code that assigns the placeholder values to your Jinja2 templates and renders a new text string according to these values. Here, ‘name’ is the name of the python variable that we’ll pass into the template, which holds the string placeholder that we want to include in the template. There is much much more you can to with Jinja2 templates. For example, we have only shown how to render a simple variable here but Jinja2 allows more complex expressions, such as for loops, if-else statements, and template inheritance. Another useful fact about Jinja2 templates is you can pass in arbitrary python objects like lists, dictionaries, or pandas data frames and you are able to use the objects directly in the template. Check out Jinja2 Template Designer Documentation for a full list of features. I also highly recommend the book Flask Web Development: Developing Web Applications with Python which includes an excellent guide on Jinja2 templates (which are the built-in template engine for the Flask web development framework). Let’s say you want to print PDFs of tables that show the growth of a bank account. Each table shows the growth rate year by year of $100, $500, $20,000, and $50,000 dollars. 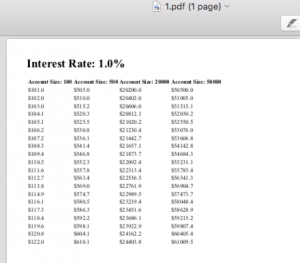 Each separate pdf report uses a different interest rate to calculate the growth rate. 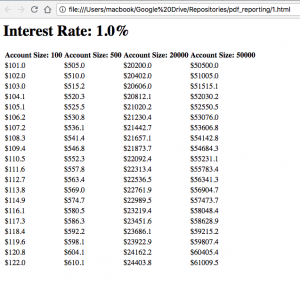 We’ll need 10 different reports, each of which prints tables with 1%, 2%, 3%, …, 10% interest rates, respectively. Lets first define the Pandas Dataframes that we need. data_frames contains 10 dictionaries, each of which contain the data frame and the interest rate used to produce that data frame. Next, we create the template file. We will generate one report for each of the 10 data frames above, and generate them by passing each data frame to the template along with the interest rate used. After creating this template, we then write the following code to produce 10 HTML files for our reports. As a final step, we need to convert these HTML files to PDFs. To do this, we use pdfkit. 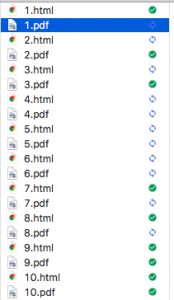 All you have to do is iterate through your HTML files and then use a single line of code from pdfkit to each file to convert it into a pdf. You can then click on 1.pdf to see that we’re getting the results we’re looking for. We’ve given a very stripped down example of how you can create reports using python in an automated way. With more work, you can develop much more sophisticated reports limited only by what’s possible with HTML.